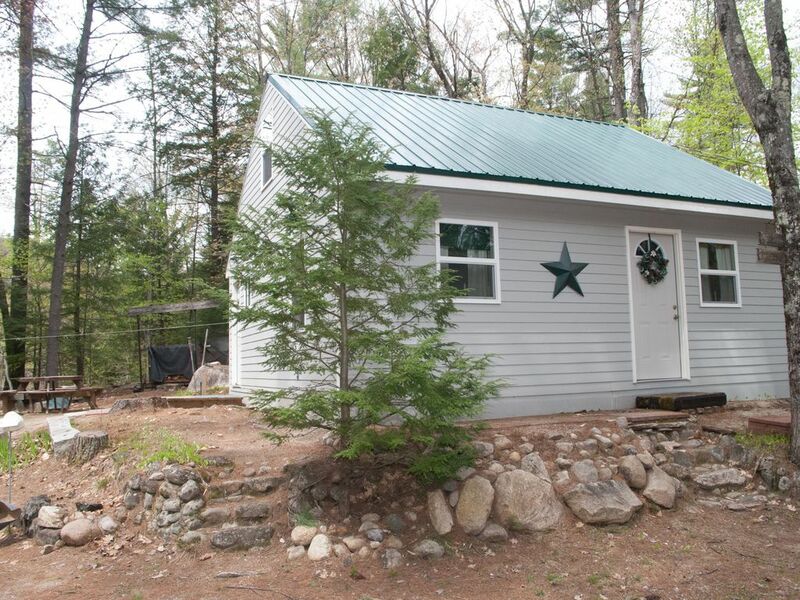 This 2 bedroom cottage is situated in a wooded community in Madison, NH., just a few minutes stroll to Davis Pond with a fishing dock and a members only sandy swimming beach to relax on. The cottage, has a full bed in master bedroom, two twin beds in 2nd bedroom upstairs with an adjacent sitting room. Linens provided. First floor living room has a love seat sofa with twin size pull out bed and twin recliners. There is a TV with a built in DVD player for watching DVD's only as there is NO cable or satellite at this time. We do have a limited DVD library. Full kitchen with gas stove, dining seating for 5, full bath, outside gas grill, wood fire pit (please no out of state fire wood) and picnic table to enjoy the sun dappled yard. This is a family owned cottage that family members have enjoyed for generations and continue to spend time at. Summer trails to walk on, winter brings snowmobiling, XC skiing and snow shoeing, from door, easy access to NH Corridor #19 from the yard. Located on the south end of the Mount Washington Valley activities; Silver Lake 5 miles, nearby ski areas (King Pine 8mi, Cranmore 13mi, Attitash/Bear Peak 18mi), North Conway Village and outlet shopping area 10 miles. Hiking/mtn biking trails, great restaurants. Fall brings leaf peeping, more hiking, imagine your weekend or week here in the splendor of the mountains. NO Cable or Satellite, TV has no reception but has a built in DVD player so you can watch DVDs. Bring your own or use the limited selection provided. We spend the weekend in October and we highly recommend the place. Very nice cottage with all you need, great location quiet in the woods and very friendly and accommodating hosts. This house was excellent! It was nice and clean and exactly what we needed. Laura was an excellent host! She was very responsive when we had questions. I would recommend this house to anyone! This cottage was everything we hoped for. First of all, Laura is so wonderful and nice. She made us feel welcomed from the moment we met her. She explained everything the cottage has and warned us in advance of any noise due to the fact that the weekend we stayed was Labor Day weekend, but I think the only loud person in the whole neighborhood was my 4 year old. The cottage is the perfect size for a small family and is equipped with everything you will need. It felt like home and was so comfortable and so clean. The no cable and no WiFi was not a problem for us. We’re there to get away from everything and relax. And the cottage is close to family activities which is a huge plus. I’m not sure how anyone can give this cottage a bad review. My family and I absolutely love this place and can’t wait to come back! Thank you for your kind review, we look forward you and your family staying again. Laura and her family were very nice. There cottage was exactly what i was looking for perfect location, peace environment, comfortable and nice place for Bbq, fire pit. I love this place I will definitely come back again. Thank you Laura for warm hospitality. Thank you for your review, so very glad you all enjoyed yourselves. We look forward to your booking our rental cottage again. The house was well equipped for a couple or family of four. Nice outside seating area and great location to all the NH attractions. No cable but does have a DVR so be prepared for some quiet time away from TV. Owners were very accomodating and helpful. Double bed a bit small for two large adults but that is the only negative. Would come back here again.